6′+ Episode 126 (The 2014 Halloween Special) is Up! The Drool Brothers have a long and interesting history. Back in the mid 80’s, brothers Chuck Mancillas and Tom Slik decided to practice music together. Legend has it certain grooves were so difficult to play that the brothers would occasionally drool onto their instrument of choice. But although they had a name, it wasn’t until 1996 that things really started coming together. Having earned enough money playing for other bands, Chuck bought the equipment they needed to finally start making the kind of music they wanted to make. Teaming up with some like-minded musicians, the released their first single later that year. Said single was a hit and helped further cement their place in Los Angeles’ underground music scene. Their first full length release came in 2000 and was followed by Kasio Montigo in 2004, Ajax Muffler in 2009, Decoupage in 2011 and Halloween For Creeps in 2012. They aren’t kidding about the “various instruments,” either. Their number of instruments is rivaled only by their list of musical influences. Trying to pin down their exact genre is almost impossible, as they have been described as everything from “psychological pop music” to “Psychedelic Fuzz Soul.” It would probably be easier to list the music and artists they aren’t influenced by! As the subject of this review shows, they effortlessly switch from genre to genre during the course of a single album! “Introduction” is a 35 second song excerpt which sounds like it is being played on a scratchy record . There’s a xylophone, bouncy drum and plenty of wacky effects as the singer tells us tonight is Halloween. The use of a whistle couldn’t help but remind me of Mysterious Mose. In “Lost in Space,” pulsing music and space instrumentation make for an engaging track. The guitars really shine here and I love the drum work as well. I also love the amnesiac singer’s exasperated attempt to contact Saturn 3. “Tonight is Halloween” is the full (and clean) version of opening track. It has a perfect old school Halloween for kids feel and I love it for this. The sounds of waves and wind take us into the surf track “Green Tiki.” This humorous tale of the misfortunes of those who come into the titular tiki is insanely catchy and loaded with reverb. “Skeleton Girl 3000” is an extended take on a track from their 2000 self-titled feature album. I actually prefer chorus of new version and love how the opening grabs you and never lets go. The funky keyboard beat goes great with drums and guitars. You know what else goes great together? The samples from various horror movie and spook show trailers mixed with rocking guitars in “Reptile.” Despite the samples having nothing to do with reptiles, the vocals help the listener understand the connection between them. “Creeps” reminds of the the music heard during the pool party in Boogie Nights (aka “Spill the Wine” by Eric Burdon and War). Which is great, since that song rules. In contrast, “Anti Establishment Scholarship Fund” is much slower and low key. It’s done in the form of a pitch for the previously mention fund, where all the proceeds will go to you! There’s plenty of interesting electrical effects while the organ and other instrumentation are appropriately offbeat. The instrumental “Revenge of the Green Tiki” offers a wonderful exotica/surf fusion take on the beat from “Green Tiki.” In addition to the guitars and bongos, there are also touches of reverb and klaves. Things appropriately draw to a close with the 27 second “Conclusion,” where we get another scratchy record sample. Having the record get “stuck” was a perfect touch. 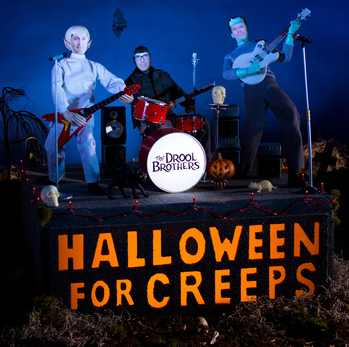 Halloween For Creeps is not only a great listening experience (whether it’s on Halloween or any other time of the year), but it also does a perfect job of paying tribute to the group’s roots. Remember their hit single? It was a little something called “Halloweenish.” The disco mix contained on the original LP’s “B” side not only turned up on The Drool Brothers along with “Skeleton Girl,” but also appeared on compilations like Listen and Learn with Vibro-Phonic and Joe’s Blue Plate Special Vol. 14. And here’s a treat: If you order the CD version, you also get a vinyl sticker featuring the Drool Brothers logo! Speaking of vinyl, the “Halloweenish” single has been reissued on orange vinyl and is now available for purchase. In addition to getting a free sticker, purchasing it will let you hear the rare “A” side featuring a guest performance by Kristian Hoffman from The Mumps. Oh, and here’s one more treat: You can download a free copy of “Tonight is Halloween” on Bandcamp! If that isn’t something to drool over, I don’t know what is. Special thanks to The Drool Brothers for the review copy!